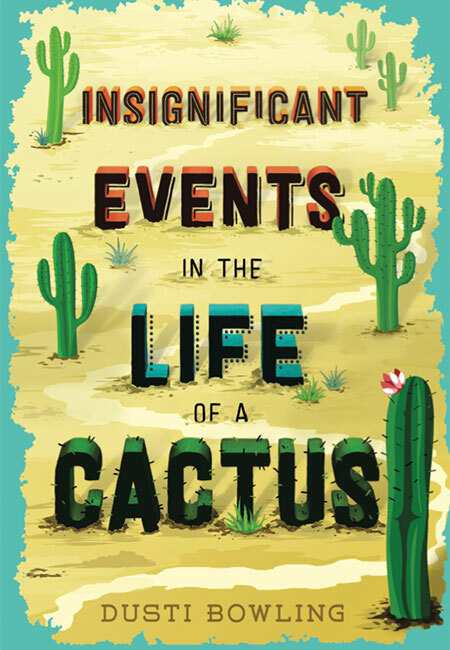 Insignificant Events in the Life of a Cactus is a book I want to put in as many readers' hands as possible. Not only is it a book that I think middle grade readers will enjoy, but one they can also learn from. Books, such as this one, that help students understand those who are different from them and develop compassion for others are much needed in our world. Aven's parents decide to move to Arizona so her father can take a job managing a Western theme park. Even though Aven was born with no arms, she is used to doing things on her own. But, when she starts her new school she has difficulty making friends and at lunch she hides in the bathroom so her schoolmates don't stare at her while she eats lunch with her feet. Then Aven meets Connor, a boy with Tourette's Syndrome, in the library where he hides out at lunch. Aven and Connor's friendship grows; they work together to solve a mystery and help each other feel a little less different. Through Aven's eyes, young readers can understand what it's like to have a disability. Aven gives readers a look at both the positive and negatives of having no arms. Aven also shows it's possible to look at life through a positive and humorous lens even when faced with challenges. There is a theme of friendship that runs through the story, as well. Aven and Connor look past the differences of each other, as well as others, to see the person underneath. This is a book about accepting others, but also accepting oneself. The setting of this book is unique. The characters are appealing. There's a mystery that keeps the plot interesting. The book is warm-hearted and inspirational. There is a lot to love about Insignificant Events in the Life of a Cactus. I hope to spread the love for this book, as it will be one I highly recommend to students and teachers.